2. ed., aum. 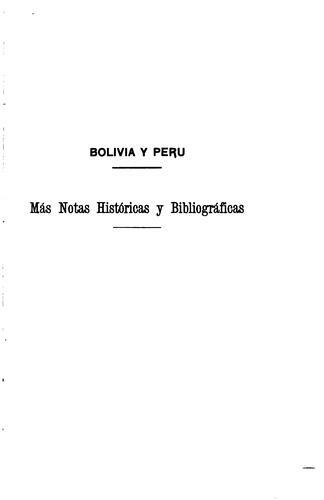 of "Bolivia y Perú". Publisher: First published in Anales de la Universidad de Chile, 1898-1899..
First published in Anales de la Universidad de Chile, 1898-1899. The More e-Books service executes searching for the e-book "Bolivia y Perú" to provide you with the opportunity to download it for free. Click the appropriate button to start searching the book to get it in the format you are interested in.